HP’s Partner Awards Program Celebrates SmartPrint’s Achievements in Managed Print. Houston, Texas – March 20, 2019 — Today, SmartPrint Inc. was recognized by HP Inc. as “HP Partner of the Year” for its work in fiscal year 2018. 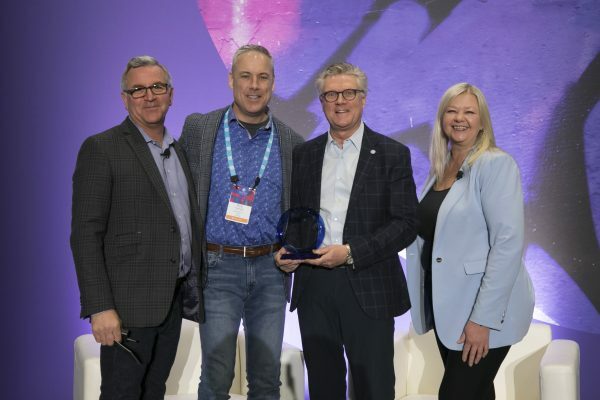 This special recognition was timed in coordination with HP Reinvent, HP’s largest global partner forum, which brings together more than 1,400 HP partners from across the globe. During the event, HP’s award recipients are recognized by HP CEO Dion Weisler and his entire executive leadership and channel team. SmartPrint was lauded in the sub-category of HP Canada Supplies Partner of the Year. This year, partners were recognized across several award categories including “Distributor of the Year,” “Premier Partner of the Year” and “Supplies Partner of the Year” to name a few. A special awards committee evaluated every eligible partner across a variety of criteria including year-over-year growth, strategic wins and revenue threshold. We’re delighted to once again, be recognized as “Partner of the Year for 2018” by HP Canada. “Pairing SmartPrint’s unique proactive fleet management with HP’s unparalleled print technology delivers a client experience unmatched in the Canadian marketplace,” said Tim Lomax, President, SmartPrint. SmartPrint is the leading Managed Print Services (MPS) firm in Canada working with large corporate clients with 100+ employees to enable them to outsource the management of their office printing and imaging devices. The goal of our managed print services program is to drive down cost, maximize efficiency and secure the print infrastructure within our clients’ organizations. Our vertically focused expertise provides custom tailored solutions to each of our client’s unique challenges. To find out more about SmartPrint, please explore our website: www.smartprint.com.